Be sure to carry your DocuBank Emergency Access Card in your wallet -- next to your driver’s license or health insurance card -- at all times. You should also periodically update your emergency contact and medical information stored with DocuBank. To do so, simply click here. You will need your member number, PIN and personal password (default set to your zip code). DocuBank provides protection for: minor children, college students, adults, and adults with special needs. 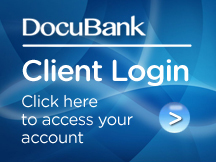 For more information on all the valuable DocuBank services, visit www.DocuBank.com.